Our March/April Exhibition Within:Without is a collection from a group of artists invited to explore jars, keeping the unique history of the form in mind. Jars are containers of perishable contents and potential carriers of content on their exterior surfaces. Their purpose may give the observer vague clues about the maker and their culture of origin. Their narratives and designs can be much more telling if the observer understands the iconography. Without a doubt, when the information is taken together (the purpose of the void within and the abundance of imagery without), we are able to conjure a more fully formed narrative about a place and the people who reside there. Some of the works take a very staunch political position, as seen in the Zach Tate’s broad definitions of jar. Speaking of broad definitions, Jeffrey Sincich reminds us with his monolithic peak that the most precious mementos can be held gently within harsh exteriors. 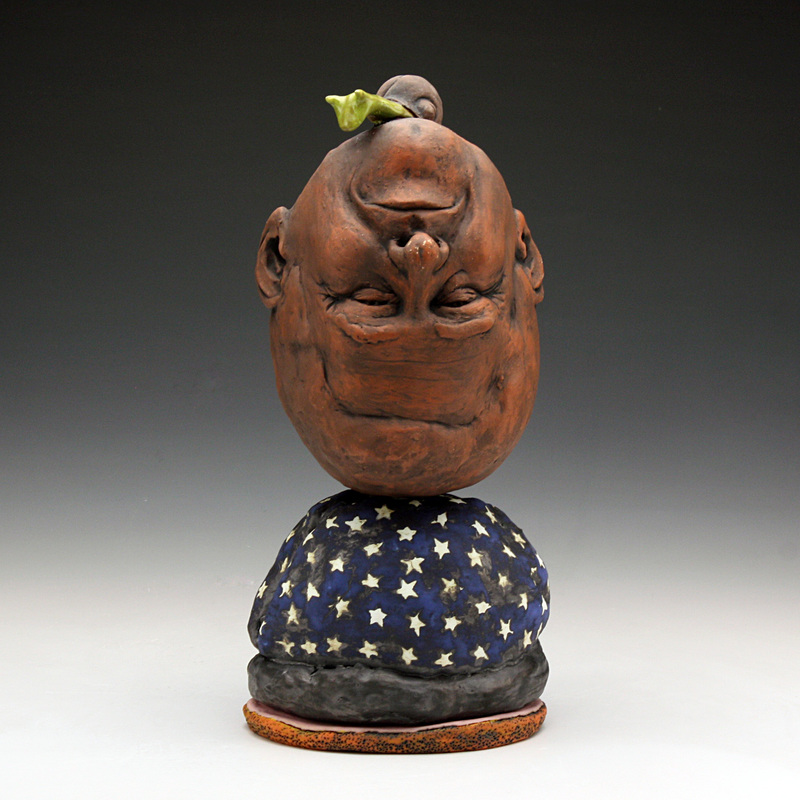 Some works, like Yoko Sekino-Bove’s jar, focus on humor and satire while celebrating traditional motifs. Some stayed safely within (dare we say decorative) motifs. Yet even the more decorative pieces explore content, process and media. Justin Rothshank’s unmistakable poppies are expertly executed upon organic forms, pushed and pulled like tilled soil, they were a response to war in the middle east. Look closely and you may find a soldier walking among the splashes of red. Jeremy Kane celebrates blue-collar culture with racing flames and chrome. A proud sparkling hitch is repurposed as a knob atop one of his lidded vessels. Somewhere between the aesthetics of Rothshank and Kane, we find an amazing ginger jar by Dan James Brown, a celebration of layered images, culture, and color. The bold Latin on the side is from the Hat Creek Cattle Company of Lonesome Dove fame. Commentators posit the misuse of Latin was intentional by the author. A commentary about grasping for credibility without any real understanding, or to use a more popular term “fronting”. Loosely translated, the phrase means, “a grape ripens in the presence of others”. Some of the artists present works that carry their own studio investigations further. William Brouillard translates imagery, well-known on his platters, into three dimensional form. Jane Shellenbarger continues to entice the viewer with her Islamic inspired vessels. Finally, Wes Harvey’s contributions to the exhibition are bold, some might say garish, kitschy exercises of self-expression and celebration of a culture proudly stepping out. From news of suicide to the ever-polarizing equality of marriage act, gay culture is a relevant topic to our contemporary culture. This unlikely grouping of artists gives us much to consider. What is the whole picture you piece together from the clues they have given?